Auchentoshan is a distillery located in close proximity to Scotland’s largest city, Glasgow. The distillery’s claim to fame is its practice of distilling its whisky three times, which, while the norm in Ireland, is unusual in Scotland where most whisky is distilled only two times. Auchentonshan therefore take a page from their Irish cousins and produce a whisky with more concentrated and cleaner ethanol which matures into a light and fruity whisky often described as a “breakfast dram” due its smoothness. 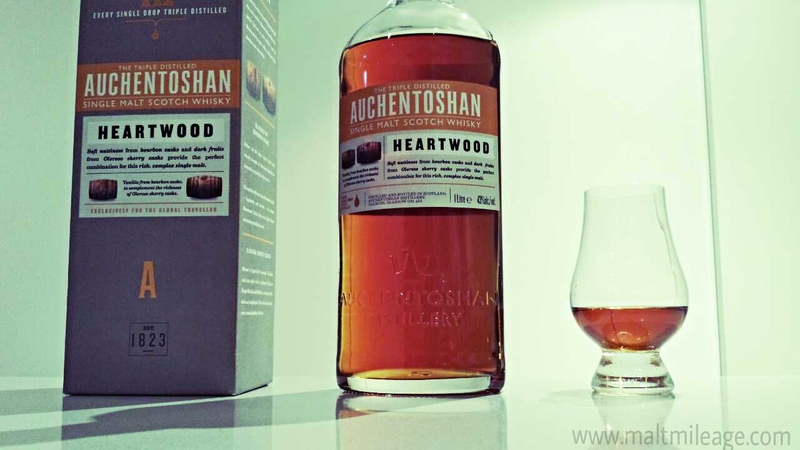 Auchantoshan Heartwood is triple distilled whisky that has been matured in bourbon casks and Oloroso sherry casks, and then bottled for Travel Retail in large 1 litre bottles at 43% alcohol volume. The nose presents with nutty overtones of almond, walnut and unsalted pistachio that combine with herbal mint/menthol cough drops and the drying woody aroma of Oloroso, cherries, chocolate, dried fruit and fresh herbs sitting on a newly made wooden table. On the palate the whisky is balanced and very smooth, immediately releasing drying Oloroso sherry with an almond and cashew nuttiness, pistachio shells, dark dried fruits such as raisin and prune, soft licorice, honey, dark chocolate and the flicker of picante spice with cinnamon sugar that fades at mid-palate into a herbal glow of mild eucalyptus and mint hot chocolate. The finish curiously sweetens as undertones of Oloroso remain dry, offering cherries, alcohol soaked raisins, creamy vanilla, dusted cocoa and dry wood. Overall, Auchentoshan Heartwood is a smooth and light whisky that offers a fusion of dark dried fruit, dry Oloroso with powerful wood notes, nuttiness and a herbal glow. With booming Oloroso sherry notes and a constant nutty hymn, this whisky is delectable with a block of creamy goats cheese or some buffalo mozzarella – absolutely perfect while star gazing, watching a movie or puffing on a mild cigar. Talk about la bella vita! This entry was posted in Lowlands and tagged auchentoshan, dutyfree, lowlands, Scotch, sherry, Travel, whisky. Bookmark the permalink.